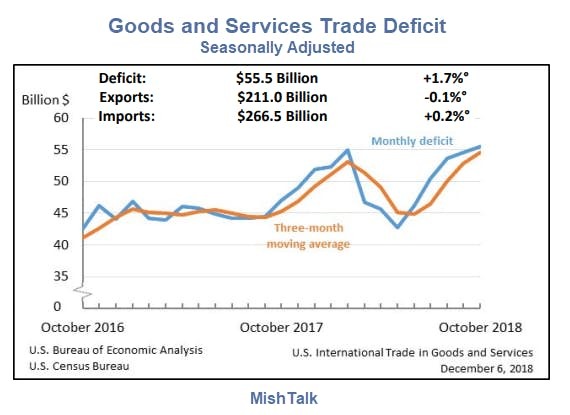 Year‐to‐date, the goods and services deficit increased $51.3 billion, or 11.4 percent, from the same period in 2017. Exports increased $149.3 billion or 7.7 percent. Imports increased $200.6 billion or 8.4 percent. Imports of consumer goods increased $2.0 billion. Pharmaceutical preparations increased $1.5 billion. Other goods increased $0.8 billion. Automotive vehicles, parts, and engines increased $0.7 billion. Capital goods decreased $3.2 billion. The deficit with China increased $0.7 billion to $38.2 billion in October. Exports decreased 2.6 billion to $7.6 billion and imports decreased $1.9 billion to $45.7 billion. The deficit with China increased $10.3 billion to $95.9 billion in the third quarter. Exports decreased $3.1 billion to $46.0 billion and imports increased $7.2 billion to $141.9 billion. The deficit with the European Union increased $6.3 billion to $30.2 billion in the third quarter. Exports decreased $2.0 billion to $143.2 billion and imports increased $4.2 billion to $173.4 billion. The deficit with Japan decreased $1.9 billion to $13.4 billion in the third quarter. Exports increased $0.5 billion to $30.4 billion and imports decreased $1.5 billion to $43.7 billion. Those tariffs sure are working. Unfortunately, in reverse, especially soybeans.